MONTEBELLO — Cantwell High School began the week with an outside shot for a Del Rio League title.Bishop Amat put an end to those hopes early Thursday.Alyssa Barrera and Madeline Ramirez each had four RBIs to lead the Lancers to a 17-0 victory over the host Cardinals in a Del Rey League game that was halted after five innings due to the 10-run rule.Ramirez and Barrera had three and two hits, respectively, for Amat, which improved to 15-6 overall and 8-1 in league play. The win keeps the Lancers tied for first with St. Paul, who they face on May 11. Britney Huerta and Julia Guzman had singles for the third-place Cardinals, who slipped to 12-10 and 4-5.Cantwell lost to Amat, 3-0, on April 14, and the Lancers made sure early this one would be different. They scored three runs in the first and seven in both the third and fourth to put it away. California 7, El Rancho 3 — Daniel Alvarez pitched six innings, striking out eight, and Mikey Elliot got his seventh save to lead the visiting Condors (20-4, 9-2) to the Del Rio League win. WHITTIER — California High School’s Sam Bautista has arguably been the area’s top distance runner the past few seasons, and the senior received his just rewards for his effort Thursday. 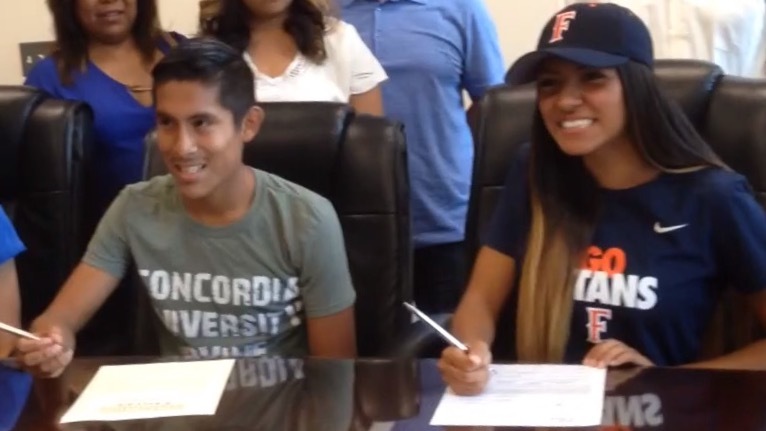 Bautista, along with teammate Stephanie Cortez, signed letter of intents to Concordia University, of Irvine, and Cal State Fullerton, respectively, in a ceremony at Cal High. Bautista was the Whittier Daily News Runner of the Year this past fall. He won the Del Rio League championship and placed 32nd in Division 1 at the CIF-Southern Section cross country finals at Mt. SAC. Concordia currently competes in the Golden State Athletic Conference in NAIA, but the school is transitioning to NCAA Division II. Cortez was first team all-area this past fall. Cal State Fullerton competes in Division I and the Big West Conference. She said her decision weighed heavily on academics. Teammates Ilse Cacho and Alex Trejo are expected to sign in the next few weeks with Holy Names, of Oakland, and UC Irvine, respectively. 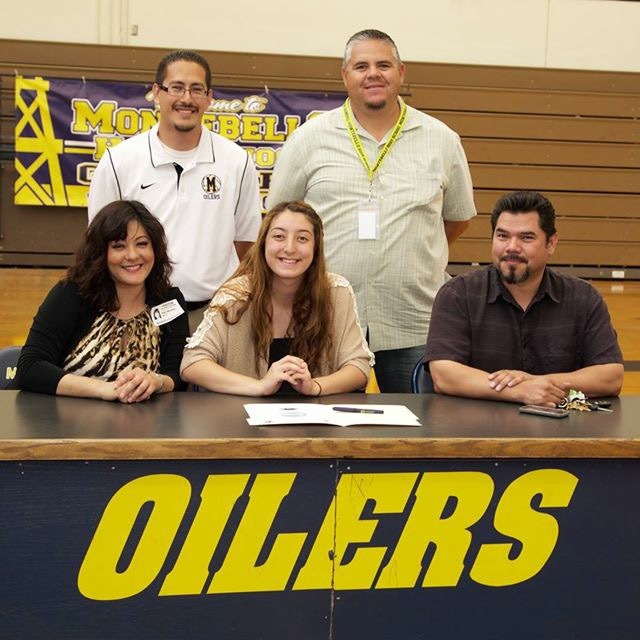 Montebello girls volleyball player Cassandra Schwamborn signed a letter of intent to Wesleyan College in Mt. Pleasant, Iowa. She was first team All-Almont League and the Oilers most valuable player. Montebello was 16-13 overall and finished third in the Almont League. 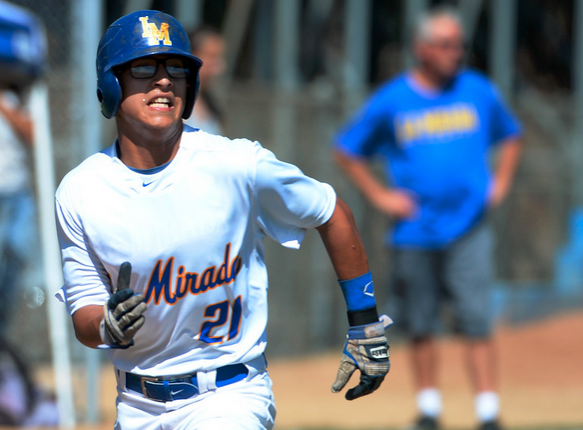 LA MIRADA — La Mirada High School’s slow start to the baseball season is now a distant memory. The Matadores continued their recent surge with a 10-4 victory over visiting Norwalk in a Suburban League game on Wednesday. Ethan Lopez had three RBIs and Omar Myzel had three hits for La Mirada, which improved to 14-11 overall and 6-1 in league play. Norwalk slipped to 6-11 and 2-7. The win was the Matadores’ 11th in their past 14 games. They began the year 3-8, playing arguably the toughest schedule in the area. The Matadores were in a good spot on Wednesday, taking a 9-0 lead after three innings. 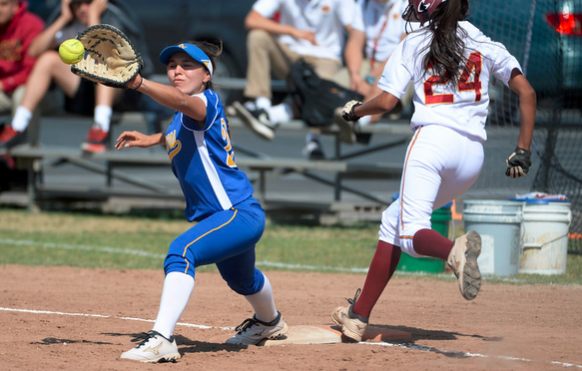 La Mirada, helped by two Viking errors, scored four runs in the second. Myzel and Jakob Gonzalez, who each had singles, scored on back-to-back miscues before Matthew Hickman and Lopez followed with RBI singles for a 4-0 lead. Hickman had a RBI single and Lopez a two-run double to highlight a five-run third for a 9-0 lead. Starting pitcher Shawn Dumser carried a no-hitter into the fifth before giving up four runs. He finished with three strike outs. La Habra 6, Sonora 2 — Janelle Rodriguez was the winning pitcher, striking out nine, and Amanda Akels went 2 for 2 with two homers and three RBIs for the Highlanders (15-7,4-1) in a Freeway League win. La Habra’s Nikki Butler went 2 for 3 with an RBI and a home run, Jayanna Perez and Tatyana Peko each had a double. Whittier Christian 3, Maranatha 0 — Josh Sorely had 14 kills and two blocks, Ron Bellamy had 10 kills and four blocks and Justin Osborn had five kills and three aces for the Heralds (12-10-1, 4-2) in a 25-23, 25-9, 25-20 Olympic League victory.